Once again, I've used a birthday as the pretext to celebrate one's art. Today's Illinois Jacquet's day and the birthday present is a rare video of his big band in Bern, 1998. 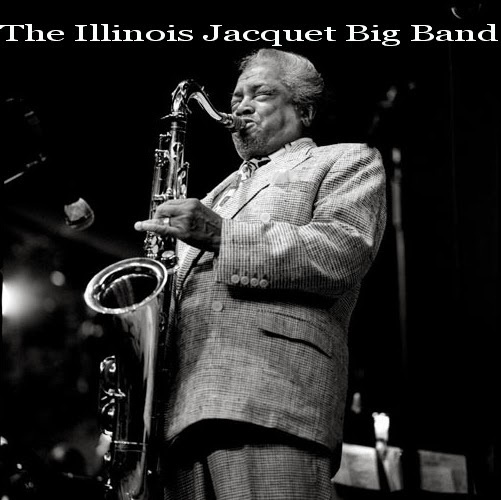 Naturally, the concert in its entirety serves as an overview of his career and inclusion of each song in the repertoire reflects a stage of Illinois' career, starting from the smashing hit Flying Home with the Lionel Hampton Orchestra to the standards of the Count Basie songbook. 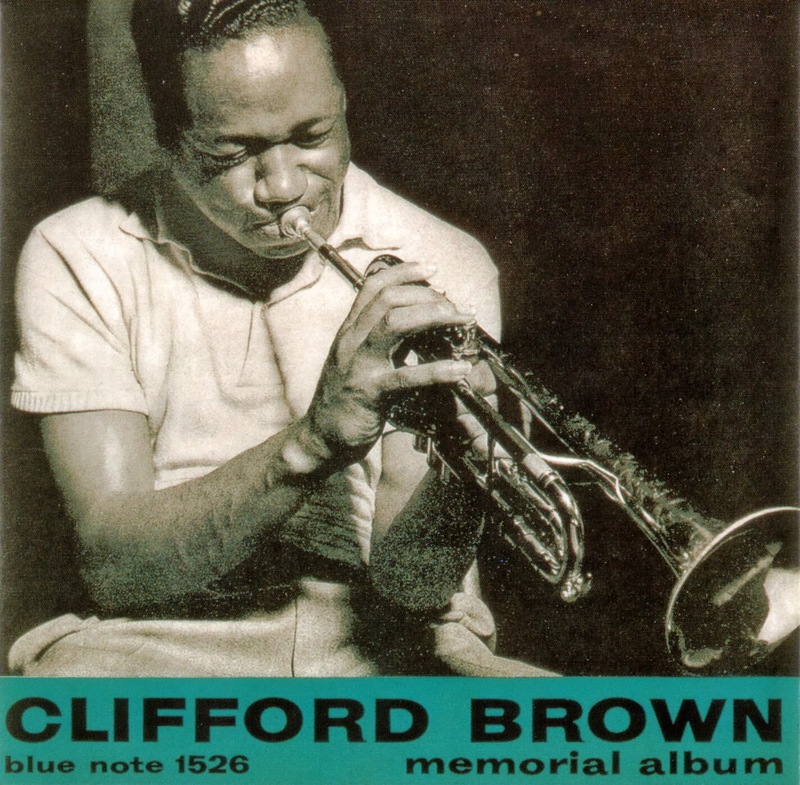 Clifford Brown was three years younger than Lee Konitz, two years Horace Silver's junior and one year Benny Golson's. All the mentioned musicians are alive, some if them still going strong, but it's painfully difficult to accept that one of the best musicians in jazz history has left us for nearly 6 decades. As they say, The Good Die Young, but it is the time for celebration rather than mourning and lament. Today's Clifford Brown's birthday and Take the "A" Train commemorates the short and once blooming life of Clifford Brown by playing two tapes from David W. Niven's archives. Throughout the tapes, Niven injects personal observations and speculations, anecdotes, history and touching quotes which makes the tapes even more precious. The Memorial Album happened to be one of my first (and due to conditions of life in Iran, one of the very few) acquired jazz CDs. The album contains two early sessions, one a quintet and the other a sextet, led by Brownie. However, Niven's tapes are not exactly track by track replica of the Blue Note release. In order to give a survey of Brownie's recording during the summer of 53, Niven has mixed takes from Brownie Speaks (Applause LP) and Memorial (LP edition). Bridges-Go-Around (1958), made by one of the forerunner Jazz Film artists of all time, Shirley Clarke, is a short film, or more precisely two shorts in one. Composed of a series of shots from New York bridges, the film, in its first half, is edited and synced with the music of Teo Macero. For the second half, the very same images, as the first half, are repeated, but this time they are accompanied by the electronic music of Louis and Bebe Barron. So Bridges-Go-Around is a film which is played twice, but each projection, thanks to specific effects created by each musical genre, gives a distinctive impression and even the meaning of the images change and assiduously contrast/complete/comment on the other half. In fact, Bridges-Go-Around wasn't originally designed as a twice-played film with two soundtracks, but it was merely one four-minute-long film with Barrons' music. Clarke used the music of Barrons, but when the copyright issues arose, she asked Columbia records jazz producer and trumpet player Teo Macero to compose a replacement. Later, Clarke who liked the both versions started screening them back to back. Like a jazz musician, Clarke turned the spontaneity of moment into an extension of her art, a prudent experimentation which can be seen as a study of the relation between sound and image. Photo © Daniel Sheehan. Source. Let's start with an enlightening fact: do you know what ahmad jamal means? Obviously it is an Arabic name (long ago, in Pittsburgh, he was Fritz Russell Jones), but not just any name. Ahmad means highly praised "implying one who constantly thanks God" and jamal means beauty; In brief, Highly Praised Beauty. That is indeed the music of brother Ahmad Jamal. 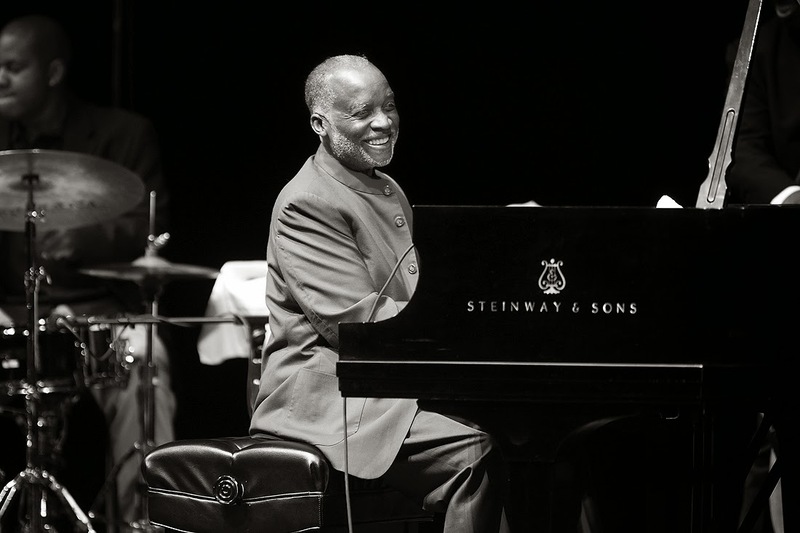 You probably know that the new Ahmad Jamal album, Saturday Morning, is out. 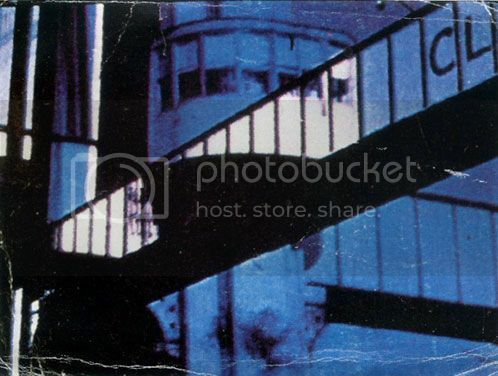 It's been described by Ahmad's website as an album "following on from Blue Moon...made up of the kind of ballads to which only he holds the key. Each one is a moment of grace, shining like a star in the sky of American Classical Music...with his light-fingered but rhythmic style, he sends us into a sensuous trance and leads us to a musical climax: a sound, which is pure groove." The album can be purchased here. For this post, I have a 45 minute long video of an Ahmad Jamal concert to show you. 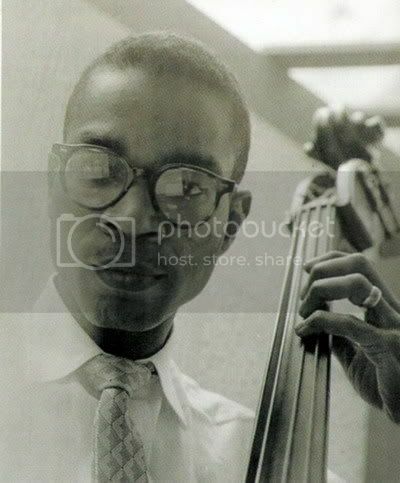 Happy birthday to Wendell Marshall who like his first cousin, the legendary Jimmy Blanton, became the bassist of Duke Ellington Orchestra from September 1948 to January 1955. Take the "A" Train feat. W. Marshall. Credits here. © courtesy of Pablo Records. Celebrating what would have been John Birks Gillespie's 96th birthday. 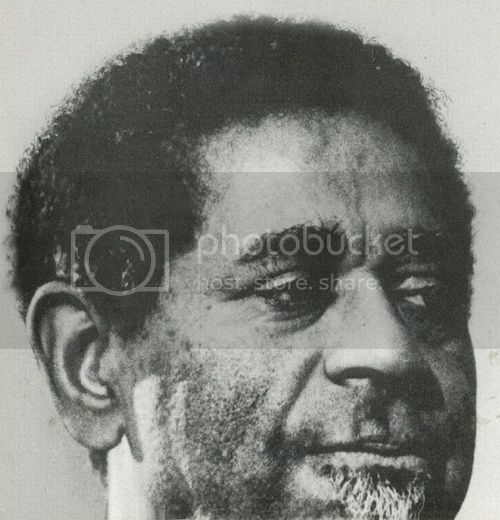 WBAI fundraiser "Dizzy Gillespie Day" held at the Village Gate in New York City on August 30, 1977. 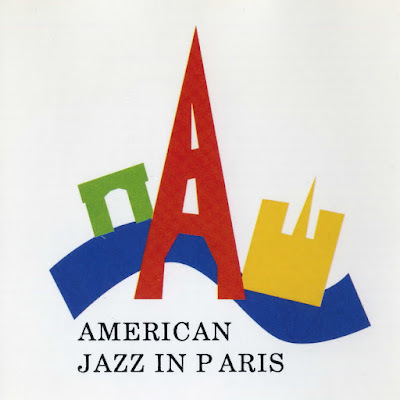 This recording contains part one of the event, an interview with Dizzy Gillespie's guitarist Rodney Jones and the music of jazz pianist Rio Clemente. This scene comes from Love You Madly, one of the best Ellington documentaries which was originally made for TV in the west coast. The interviews are conducted by Ralph Gleason. I'm knee-deep into London Film Festival and an overdose in film has kept me away from this venue and blogging on jazz. For the sake of reassurance, and promsing that I would return to jazz life soon, I'm posting a recent VHS transfer of a fabulous trumpet summit in which the cream of Ellington and Basie trumpet alumni are on stage together: Joe Wilder, Snooky Young, Harry "Sweets" Edison and Clark Terry! The event was originally presented as the Legendary Trumpet Masters at the Jazzfestival Bern '97 (May 1) in Switzerland. In addition to the trumpets, our favorite Hank Jones is on piano, Jesper Lundgard on bass and Clarence Penn on drums. The whole concert (also featuring Doc Cheatham), including its nine songs, intro and interviews was broadcast on Swiss and German TVs in 1997. "Monday evening, October 28, 1963. Hundreds take their seats at the Race Course in Dhaka, excitement buzzing through the crowd. On the stage stands an upright bass and a drum set, along with a piano brought over from the Goethe Institute. There is a slight dampness in the air, and a piano tuner has been asked to stand by. After an introduction, more than a dozen musicians from the U.S., mostly black men, take to the stage. 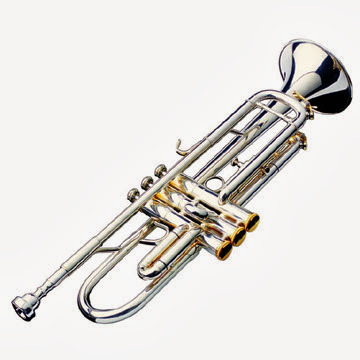 The horn section brings along their well-loved trumpets, saxophones, and trombones. The silence of the night is broken by the melody of Billy Strayhorn’s composition, “Take the A Train,” familiar to some because it is the theme of the Voice of America’s Jazz Hour. 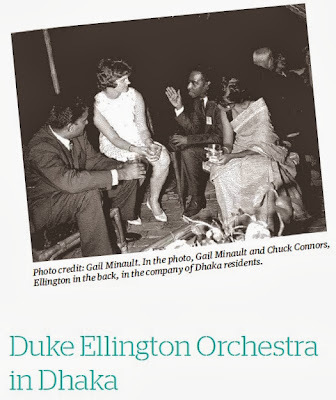 It will be followed by other tunes like the wistful “Mood Indigo” and the swinging “Things Ain’t What They Used to Be.” For an hour and a half, the Duke Ellington Orchestra, with some of the world’s finest jazz musicians – including Paul Gonsalves and Sam Woodyard – will make the Dhaka air reverberate with the soulful and sizzling sounds of jazz." The piece continues to give an anecdotal, as well as sociopolitical picture of Duke in Dhaka. The writer of the article is Mahmud Rahman whose knowledge of the Dhaka concert has benefited this blog on the post I did earlier this year. Mahmud is also the author of Killing the Water (Penguin India) and Black Ice (Harper Collins India). Download the full article here. It's on page 6 of the PDF.